When you Shouldn’t Create Systems for your Business - Organising Works! 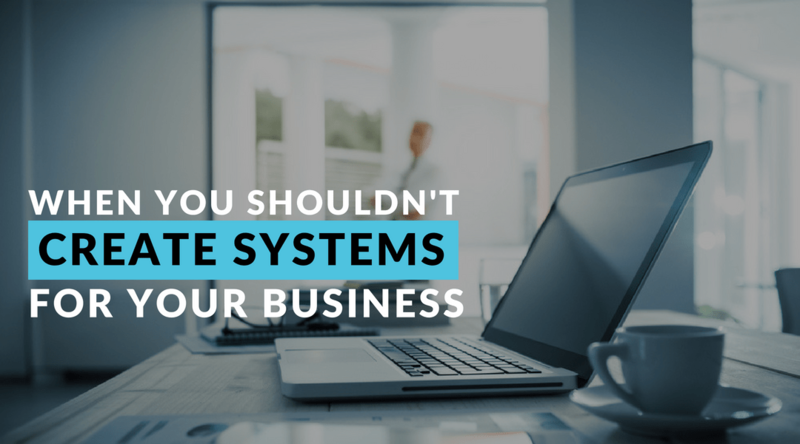 Every business needs systems to become successful right? True, but there is a point at which it isn’t smart to systemise your business. Stay with me, and I’ll explain. This is a message to all start-up businesses – don’t focus on creating systems too early. Don’t focus on creating systems too early. There are 4 stages of business growth. All this is necessary but only at the point in your business journey where it makes sense to focus on these things. If you are in the start-up stage, systems should not be your focus. Just to be clear, when I’m talking about systems I mean doing things like spending time working on workflows, documenting procedures and assessing automation tools etc. I don’t say that you shouldn’t create simple systems like running a daily checklist of tasks and a system for assigning tasks. It benefits everyone at any stage of business to have some basic time and task management systems in place. When you are a start-up, unless you are systems orientated already, you won’t be speaking in systems language at this point. Systems most likely will not be your area of expertise. The time you might spend implementing systems is time that you should be focusing getting your business to the next stage, the ramp-up stage. Over time, you will notice that a pattern emerges to some of the things that you are doing, they become your systems. You’ll also notice things that are important but not necessarily something that you should be doing; they are not the best use of your time. This is when you start to move to the ramp-up stage, and you start to delegate some of the tasks that aren’t dependant on you. This in turn starts to free up more of your time. By ramp-up stage, you are starting to recognise what systems you already have. These systems have been operating long enough for you to know if they work. The next step is to get someone on your team who has the skills and aptitude to help you create, improve and document the systems. 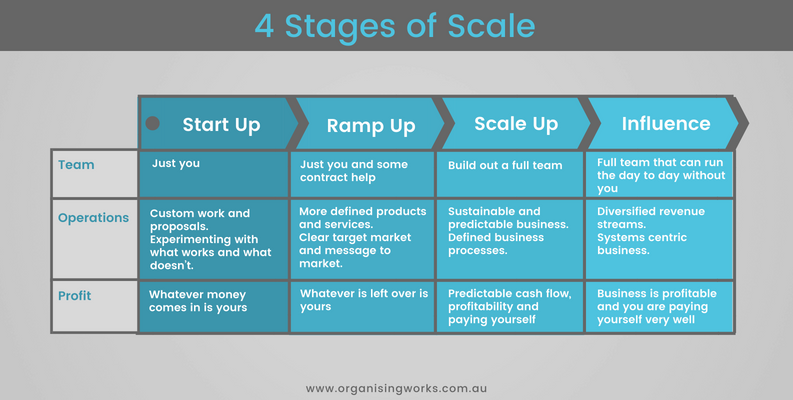 Once you get to the scale-up phase of your business, you’ll have some reliable systems in place to help you bring on more people and train them to run the systems. You’ll keep improving and refine your systems over time to the point where you can start to pull away or even remove yourself from the business gradually. There will come a point in time when you can start to pull away or even remove yourself from the business gradually. The final stage is being an influencer inside and outside of your business. Once this stage is reached it’s really up to you where you focus, it’s your vision. For some, it may be to move on and sell the business, after all, you have grown an asset that can work without the business owner. For others, it may include starting other businesses or choosing to have a better work-life balance. So to summarise, systems aren’t your focus at start-up, at this stage, it’s all about getting customers and generating revenue and experimenting with what works and doesn’t. Get some basic organisational systems in place as things can get chaotic at start-up. At ramp-up stage, start defining and refining what works in the business. Get some help on board initially to free up your time. Start putting together workflows and looking at tech solutions that can scale as you grow. Work on getting your core systems in place around revenue generation and delivering your service/product to your customers. Have someone inside or outside your business help you with systems creation and documentation. When you reach scale-up stage, it’s systems take off time, time to get serious about systemising your business, delegating, automating and getting yourself out of the day to day operations. Influencer stage, well, that’s anything you want it to be. Have someone inside or outside your business help you with systems creation and documentation. What stage of business are you at? If you need more help deciding where to focus, when to systemise, and what to systemise, take our quiz. If you have identified your stage of business and are ready to systemise, the next step is to get some help. Arrange a Systems Success call with me and let’s talk about what’s possible.